The Prater, north of the city centre of Vienna, is actually a park of several square kilometres. 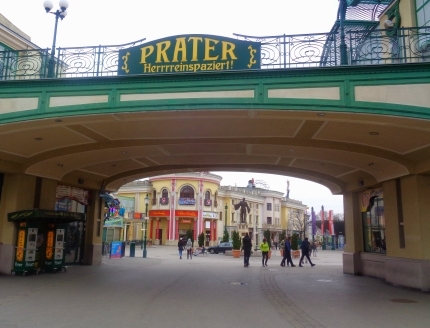 Mostly, however, the term „Prater“ is colloquially understood as the amusement park Prater, which is officially called Wurstelprater. The Viennese Prater is something like a funfair, folk festival or fair that takes place all year round. The many attractions are permanently on the Prater. The Prater is also open in winter. But then there is less going on. The big attractions like the Ferris Wheel or the Madame Tussauds Wax Museum are open during the cold season. However, many attractions have a longer winter break. Almost everyone in Germany and Austria knows the Vienna Giant Ferris Wheel. It has become a landmark of the city of Vienna. It is in the middle of the Prater amusement park. We have dedicated an extra page to the gigantic wheel, which you can find here. A new major attraction since 2011 at the all-year Prater fair is a branch of the famous wax figure exhibition Madame Tussauds from London. Here you can also read a separate page in this travel guide. Apart from that there are many other attractive attractions on the Prater. On the one hand there are several ghost trains like the famous „Hotel Psycho“. The ghost train is said to have been invented even in Vienna. Very popular are also the box car tracks and the kart track. 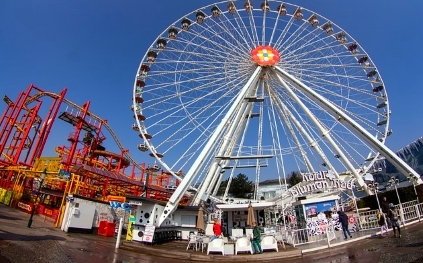 There is a second Ferris wheel with the beautiful name Blumenrad (flower wheel). Further highlights are for example a wild alpine railway with water and the Prater tower. This is a gigantic attraction, which brings the passengers to a height of about 100 meters. Also the gastronomy in the Prater is very popular among tourists and locals. There are several restaurants with food and drinks. Above all, a lot of beer is served. 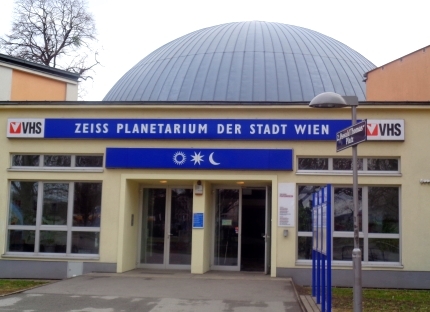 In addition to the Prater Fair you will find the modern Planetarium Vienna, probably the most famous planetarium in Austria. Every day there are several demonstrations, in the afternoon often for children, in the evening for adults. How to get to Prater: The best way to get there is by underground (stop Prater Stern, U1 and U2, also S-Bahn). Admission and prices Prater Vienna: The Prater is a fair (Volksfest) and costs no admission. Visitors pay for the individual attractions. We found the prices on the Prater to be reasonable, not overpriced. You can also just do a sightseeing tour and not spend any money. Opening hours Prater Vienna: The grounds of Vienna Prater are not closed at night. The individual providers of gastronomy, rides, etc. determine their own opening hours. Be careful, the main season is from mid-March to the end of October. There is little going on on the Prater in snow and cold in winter. Many attractions are also open late at night in summer, some until after midnight. The opening hours in the morning start typically around 10 am. Good weather is an advantage when visiting the big party at Vienna Prater.